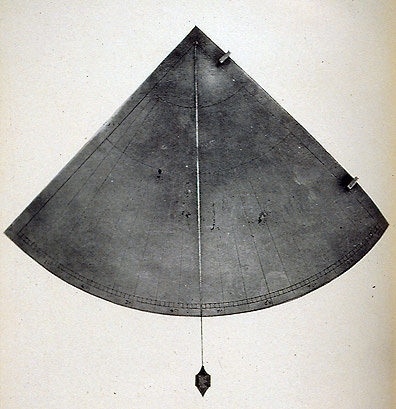 The seaman's quadrant was first used at sea around 1460, about twenty years before the astrolabe. It is a quadrant of a circle, made of wood, with a sight up one side, a scale along the arc, and a hanging weight on a string from the apex of the quadrant. The quadrant was used to tell relative distance traveled north or south from a port of departure, something done more easily than measuring an accurate sun height to determine latitude.